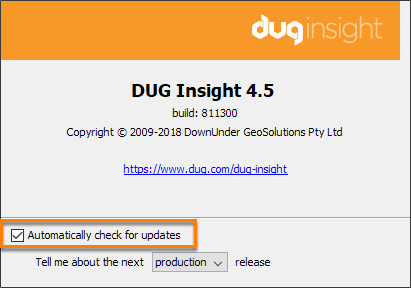 When you launch Insight, it will automatically check for the availability of a software update. This is a default setting. However, you can disable this automatic checking by following the steps below. In the Control Panel, open the Help menu and select About DUG Insight. Clear the Automatically check for updates check box to disable the automatic checking. Tip: Once you have disabled the automatic software update checking, you can still check for software updates manually. In the Control Panel, go to the Help menu and click Check for Updates (see Checking for Updates (Help)).